I attended the 1969 Can-Am at Mosport (Canadian Tire Motorsport Park) as a spectator, but had never put a wheel on this legendary track up until the May 2-3, 2015 Challenge Cup event held there. I thought I would jot down my observations about driving this circuit, however keep I mind that I am definitely not an expert here after only one weekend of racing, and if you follow these directions, your results may vary. As good fortune would have it, my wife Maxine and I were paddocked near veteran Mosport driver Bill Mitchell and he kindly offered to “tow” me around and show me the line. This proved to be a great help in learning the track. My overall impression of this circuit is that it is akin to a high speed roller coaster and extremely challenging, with many blind apex turns and steep elevation changes. The first turn after the Start/Finish is taken flat out, but one must hit the apex or you can run out of room at the exit (experienced first hand). Turn 2 starts at a rise and dives deeply to the left, with the (double) apex out of sight at turn-in. The fast guys say they can take this flat out, but I was definitely lifting. If one hits both apexes right it is fairly smooth, but my car would sometimes get somewhat sideways about half way down. I was advised by one of the Canadian drivers to just brush the brakes for Turn 3 and when taken properly it feels “like a cat clawing across a chalk board”. This corner is fairly flat and one can basically see the apex on entry. Coming up to Turn 4, I was told to aim for the “O” in the Continental Bridge sign to set up for the turn and this proved to be very helpful advice. This turn is full bore and quite a ride as the track dives steeply and then rises immediately afterwards into Turn 5a. You downshift to third gear for 5a accompanied by heavy braking. A short straight leads to Turn 5b and I found that the best way to set up for this was not to look straight ahead, but turn your head to concentrate on the apex, which comes up quickly. After 5b comes the long, winding back straight (Turns 6 & 7) leading into Turn 8. I was lifting for this turn, but the veteran drivers all claimed it could be taken at full throttle. One must aim for a very late apex and do all your braking only after the wheel is straight to set up for the medium speed left Turn 9. You need to sacrifice some speed in 9 so you can get over to the left, if you don’t you will be incorrectly set up for the final corner, Turn 10. This last right hand turn is similar to the previous one – a ninety degree mid/late apex which is fairly straightforward with a rumble strip on the outside of the exit that can be utilized if needed. My overall impression of CTMP/Mosport was very positive – a great track that I would definitely return to again. If you haven’t been there you are missing out on a great driving experience. 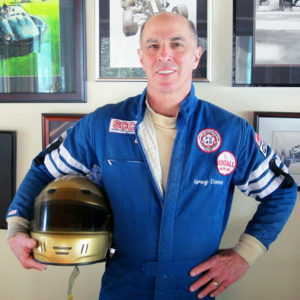 Formula Vee Racing In The U.S.